(1) Mary G. (Morris) Bemenderfer (b. 1886, Virginia), daughter of John Taylor Morris (#9) and Lelia B. (Lacy) Morris (#8). 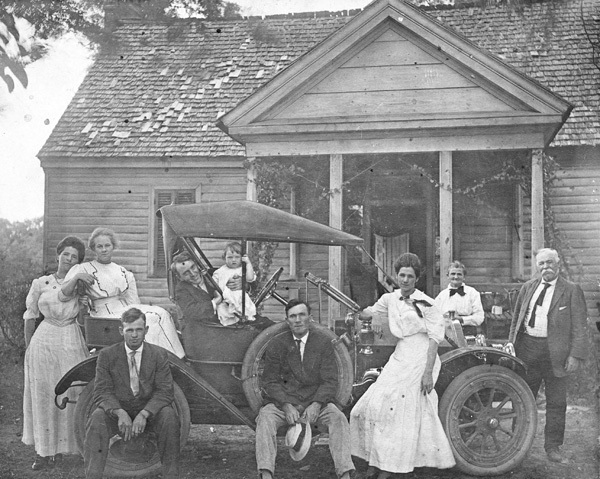 Mary married Charles Samuel Bemenderfer, and they lived in Fort Pierce, FL, until Mary's death in the 1950's. (2) Annie Morris sister of John Taylor Morris (#9). (3) John Lacy Morris, Sr. (b. 1881, Huntsville, AL - d. 1940, Virginia), son of John Taylor Morris (#9) and Lelia B. (Lacy) Morris (#8). John Lacy Morris, Sr., married Daisy Holmes Callahan (1881-1967) on 08 October 1908 in Appomattox County, VA . John Lacy Morris, Sr., died on 12 April 1940 in Scottsville, Albemarle County, VA.
(5) Virginia "Virgie" W. Magness (daughter of W. Magness (#4) and Virginia W. (Morris) Magness (#7) ). (6) Lacy Morris (b. July 23, 1888), son of John Taylor Morris (#9) and Leila B. (Lacy) Morris (#8) Lacy was an Army veteran of WWI, where he was gassed. The gas burned Lacy's lungs, and when he was discharged from the Army, Lacy went to live in New Mexico where the air was less humid. Lacy hunted and trapped animals in New Mexico and sold their hides. In New Mexico, Lacy married a lady with the surname, Gibbs. (7) Virginia "Virgie" W. (Morris) Magness, (b. July 23, 1884), daughter of John Taylor Morris (#9) and Lelia B. 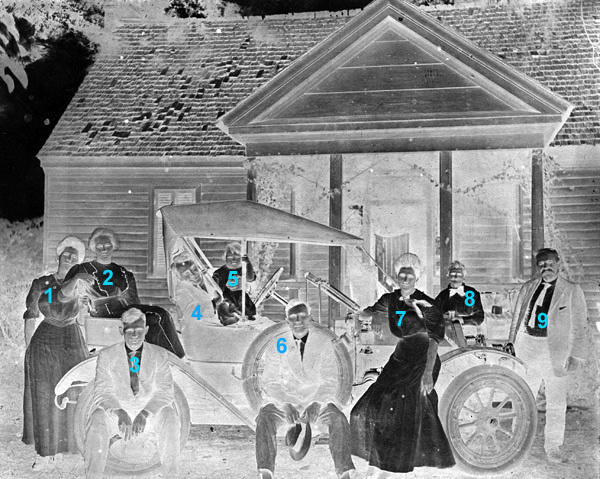 (Lacy) Morris (#8) Virgie married W. Magness (#4) of Spartansburg, S.C., and they moved to South Carolina where Virgie was secretary for a bank. After the Civil War, John Taylor Morris farmed the Morrisena property and raised grain which was ground into flour by a Scottsville area milliner. He also grew apples, pears, and cherries, although some of the Morrisena land used for the orchards was poor and the trees often did not produce much. Much of the work marinating the farm and cooking of food for their white owners was done by slaves, and after the Civil War, many of the Morrisena freed slaves came back to live and work at Morrisena. The freed slaves lived in the old slave houses on the Morrisena property which were located about 1/16th mile from the Morrisena house. These former slave homes are no longer in existence. The slave graveyard was located by the tenant house, and the white graveyard by the Morrisena home. Until the 1900's, only wooden crosses were used to mark each grave in the family graveyard. When the crosses rotted away, the grave would lose its marker. Only in the twentieth century were headstones used to mark the family gravestones in the family cemetery. John Taylor Morris also occasionally worked as an auctioneer at various livestock auctions near Morrisena. 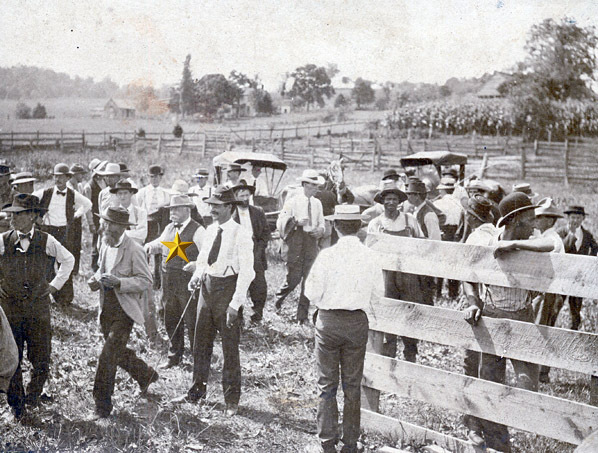 Shown below is a 1910 photo of John Taylor Morris (see starred individual in photo) headed to a farm auction near Scottsville with a crowd of white-shirted and tied gentlemen interested in the livestock for sale. These photos are part of the John Lacy Morris, Jr., collection at Scottsville Museum. In 2005, John resided at Morrisena near Warren, Virginia, and he was the grandson of John Taylor Morris and Lelia B. (Lacy) Morris. John was the last member of the Morris family to reside at Morrisena, and he passed away in Charlottesville, Virginia, on September 25, 2005.